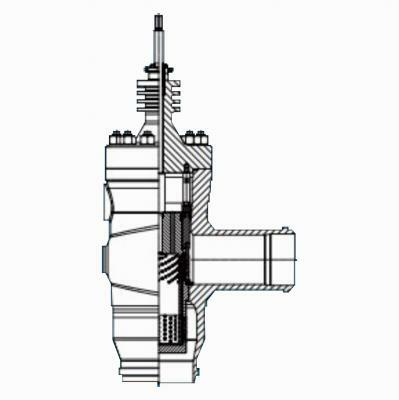 The Angular Valves Of The Series GKV3500 (PN 16 - 250) And GKV3800 (PN 16 - 400) Are Part Of The Well Proven GEKO Valve Modular Parts System. In Case Of Difficult Working Conditions And Sonic Relevant Applications It Is Often Recommended To Use Angular Valves, Because The Flow Of The Medium Is Turned Only Once By 90°, Contrary To Single Or Double Seated Valves. As Standard Equipped With The Well Proven, Reversible And Enclosed GEKO Diaphragm-Operated Actuator. Actuators: Optionally Pneumatic, Hydraulic, Electric Or Hand-Drive. Versatile Options From The GEKO® Modular Parts System For The Inner Parts. Different Spindle Bushings, For Instance With Cooling Fins, With Insulating Columns, Bellows Sealing Etc. Exchangeable For Each Other.